A thick, irregular, quadrilateral-shaped muscle sheet that lies in the posterior abdominal wall. Medial half of lower border of 12th rib and tips of transverse processes of lumbar vertebrae. Iliolumbar ligament and internal lip of Posterior iliac Crest. Iliohypogastric and Ilioinguinal nerve (both from L1). Branches from the ventral rami (L2 and L3). Branches of the subcostal artery. Branches of the lumbar arteries. The lumbar branch of the iliolumbar artery. The arteria lumbalis ima from the median sacral artery. 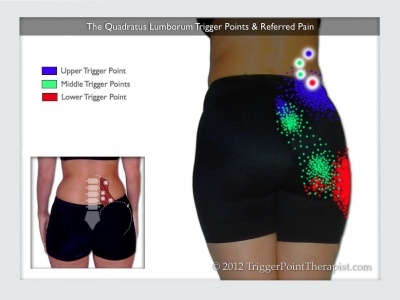 Quadratus Lumborum fixes the 12th rib to stabilize diaphragm attachments during inspiration. Lateral flexes the vertebral column. It forms with the contralateral Tensor fascia lata and Gluteus medius a lateral myofascial sling which aims to maintain frontal plane stability of the pelvis. 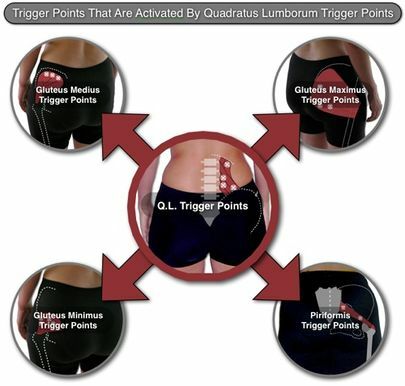 The primary antagonist to each Quadratus Lumborum muscle is the Quadratus Lumborum muscle on the other side of the body. The muscle group is considered a postural muscle group. It's one of the muscles that tends to be tight and overactive. ↑ Page .P, Frank C, Lardner R. Assessment and Treatment of Muscle Imbalance: The Janda Approach .Champaign . Human Kinetics. 2010. ↑ 6.0 6.1 Acupuncture Integrated. 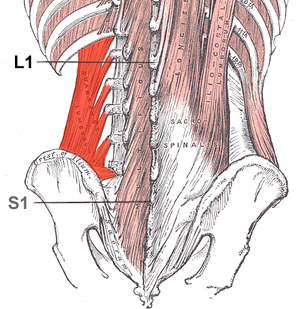 Low Back and Lower Body Myofascial Pain Syndromes. 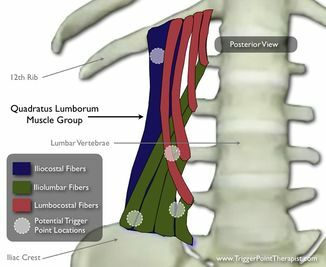 Available from: http://www.acupunctureintegrated.com/articles/low-back-and-lower-body-myofascial-pain-syndromes [accessed 19 April 2019].